Are you looking for a little something extra from your catering company? We’re talking of course about our various action stations – staffed by friendly and knowledgeable chefs trained to put a smile on your face while your dish is being prepared. Let’s take a look at what makes each one special. Unless you’ve been living under a rock, you’re well aware of the ramen craze that’s sweeping Chicago and it’s surrounding suburbs. There are so many unique ramen offerings to try within the city limits, and we’ve done the (delicious) research to provide the options people are asking for. Our ramen station is great for holiday parties. Broth is freshly infused with wild mushrooms and served from hot tea syphons. Five spice crispy pork and rice noodles come standard, but you can choose from a number of ingredients and aromatics to truly make the dish yours. If you’re torn by what to choose or aren’t sure what flavors will compliment each other – don’t sweat it. 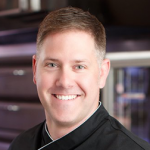 The chef serving you is more than happy to make suggestions and find something you’ll be excited to eat! It’s hard to say no to cheese, which is why we’re encouraging the exact opposite approach. Guests aren’t soon to forget your event if you opt for the raclette station. At this action station, cheese is melted to order on a raclette machine. We’d recommend bringing your phone along to get an action shot while the chef does his thing – it’s truly a sight to be seen that begs to be shared by the self-professed foodie. The fun doesn’t end there. 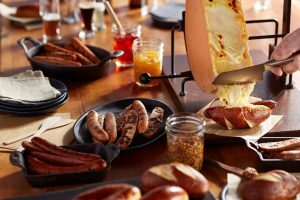 Guests have a choice between 4 distinctly different gourmet sausages and a number of complementary gourmet toppings, all served on a freshly baked pretzel bun. But don’t just take our word for it – give it a try, yourself! Chilled house poached jumbo shrimp on a bed of tequila cocktail sauce. It looks and feels like a tequila shot, being served in a salted shot glass and garnished with a lime triangle. The champagne & seafood cart will make it’s way around your event on a roaming wooden cart. So sit back, relax, and enjoy! 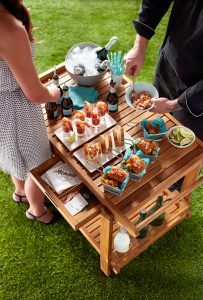 Our action stations are perfect for outdoor parties, special events, and event weddings. 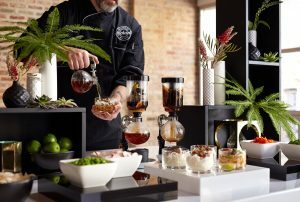 We think they add a fresh, fun, and interactive edge to a typically more static approach to catering. Give us a call to learn more about our various action stations and to see which one is right for your next special event – 847.966.6555.